Apart from the innovative Renewal by Andersen® 3D App, the Window and Door Visualizer is another handy tool that can simplify the door-buying process. You won’t have to rely on your imagination alone. It lets you see different door models and countless combinations of features to craft your dream replacement unit with no stress. Like other designing tools for replacement windows and doors, ours lets you either pick from pre-selected home models or upload actual images of your home. The only difference is that our Window and Door Visualizer offers an extensive library of photos with which to play. We offer multiple shots of different rooms taken from the inside and the outside. If you don’t have a photo available, you can begin editing with pictures that resemble the space you have in mind. Our tool prioritizes the most important design elements to help you navigate through the process in an organized way. It will only give applicable, customization choices based on your chosen door model. After selecting your door, it will ask you about its configuration, frame and trim finish, grille type and pattern, glass package, hardware style and screen. You can skip optional details and go back several steps to make changes. The best part is, our doors and windows company doesn’t require you to finish the process to review your choices. With just one click, you can save the complete list of your selected features to ensure you won’t miss anything or have things you don’t want. Once you’re done, you can print each of your creations. You can also share them on Facebook or pin them on Pinterest to hear what your friends think. If you want to send your masterpieces through email, you can save your projects and have digital copies of them in seconds. Design your replacement doors your way. 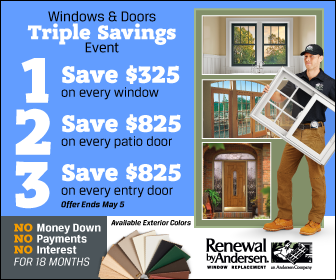 Call Renewal by Andersen of St. Louis at (314) 332-2364 to discuss your ideas. To schedule your FREE, in-home consultation in Chesterfield, MO, contact us today to set up our initial visit to your Missouri home at your convenience.